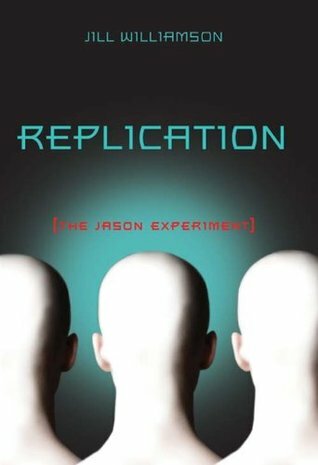 When Your Life Is Not Your Own Martyr---otherwise known as Jason 3:3---is one of hundreds of clones kept in a remote facility called Jason Farms. Told that he has been created to save humanity, Martyr has just one wish before he is scheduled to 'expire' in less than a month. To see the sky. Abby Goyer may have just moved to Alaska, but she has a feeling something strange is going on at the farm where her father works. But even this smart, confident girl could never have imagined what lies beneath a simple barn. Or what would happen when a mysterious boy shows up at her door, asking about the stars. As the reality of the Jason Experiment comes to light, Martyr is caught between two futures---the one for which he was produced and the one Abby believes God created him to have. Time is running out, and Martyr must decide if a life with Abby is worth leaving everything he's ever known. Christian Fiction is not for me. I had no idea that Replication was a mix of sci-fi and christian fiction when I requested it and wasn't aware that Zondervan was a christian publishing house either. So again, my rating/review may be one-sided. I've tried to keep an open mind while reading this book, paying more attention to the plot than go into the details. That being said, Replication had its moments of beauty. Martyr is one of 40 other clones at place called Jason Farms. He's part of an experiment that's hoping to save human beings who now exist in a dying planet. And then there's Abby, who moves to Alaska with her father who's a scientist. It was interesting to see infamous debate of science versus nature depicted in Replication. How far should humans go to save a life? When do morals and ethics kick in? The idea of this novel is pretty good and it has an engaging sci-fi element. Jill Williamson has created stimulating characters and I found her writing clear and descriptive. Abby and Marty were the most unlikely pair to fall in love and Williamson has pulled it off well. However, there were a lot of times when I couldn't relate to the story/characters but that may be just me. It's not the religion that bothered me, but I felt that the religious elements could've been something the novel could do without. For those who read Christian fiction often, I assume Replication would be be a pretty good read. Well, thank you for the really helpful review! nooo i REALLY LIKED this book! I didnt care much about the "religious" part... didnt notice it anyways! but i loved the idea! :( Although great review!